The turret clock in St James is situated on the north face of the tower and was commissioned in 1883 when the rebuilding of the tower was completed. The original clock mechanism (also dated 1883) was made by the famous clock makers John Moore & Sons of Clerkenwell, London. The clock face is 30 inches in diameter with gold hands, the hour hand having a fleur-de-lis tip to differentiate it from the minute hand. The face is bordered by two embrasures (thin vertical windows) that are glazed with leaded glass to allow light into the clock room of the tower. 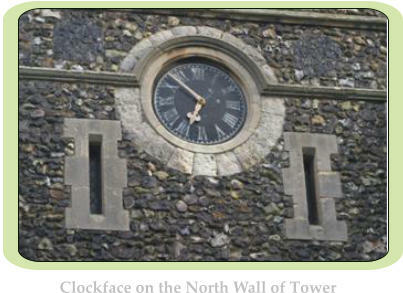 The clock face itself is bordered by a dressing of limestone to set it off from the flint faced walls of the tower. The company of John Moore & Sons was founded around 1790 and ran for almost 100 years. The company was originally known as Handley and Moore. both partners originally being apprentices of John Thwaites. Trading at 38/39 Clerkenwell Close in London, the firm became John Moore and Sons after Handley died in 1824. During this time they were prolific makers of an endless variety of clocks and other measuring devices such as wind dials and weather vanes. In 1899 the death of Henry James Moore (the last clock making son) brought the company to an end with the clock at St James being one of the last church clocks commissioned by the company. 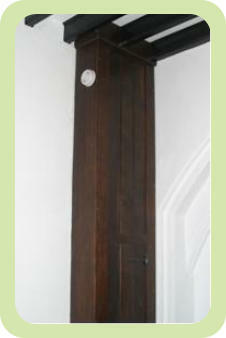 A Turret clock is the technical name for any large exterior clock made to be seen by many people at the same time. The clock at St James has a twin train mechanism with the “Going Train” driving the hands to tell the time and the “Striking Train” striking the hour. Each train is driven by a weight on the end of a steel line which is wound up round a metal barrel. On the barrel is a square, on to which the winding handle fits, to enable the weights to be wound up the tower. The weights are housed in a wooden channel cupboard that runs the length of the tower and when fully wound the weights can drive the clock mechanism for approximately seven days. On the barrel of the Going Train is a large wheel called the great wheel which drives a series (or train) of gears. 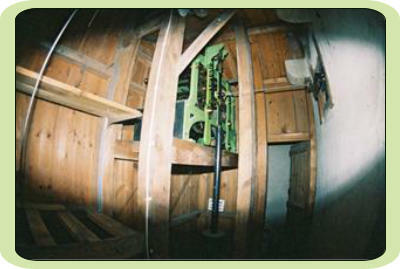 One of the wheels called the centre wheel, rotates once per hour and is responsible for driving the hands of the clock. through a series of iron rods and bevel gears known as “leading off work”. Behind the outside dial is a cluster of gears known as the “motion work”, which takes the one turn per hour of the minute hand and drives the hour hand round once in twelve hours. The last wheel in the Going Train, and the smallest, is called the escapement wheel or the escape wheel. This wheel rotates a lot faster than the others, (about once a minute), and is linked to the pendulum through the escapement, a device which allows one tooth of the wheel to escape for every swing of the pendulum. Without the escapement the trains of gears would run unchecked. As the pendulum beats time it controls the speed at which the escape wheel rotates, and hence through the train of gears (with the appropriate numbers of teeth), it allows the centre wheel to turn once in an hour. Apart from releasing the escape wheel with every swing of the pendulum, the escapement also gives the pendulum a little impulse every beat to keep it swinging. 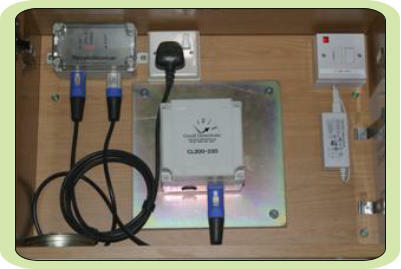 Striking the hour is performed by the striking train which operates the bell hammer. A lever in the striking train is pulled down and released once for each stroke of the bell with the lever pulling a wire which runs to the belfry above the clock. Here it lifts a heavy hammer which then falls on the outside of the bell. A check spring keeps the hammer just off the bell so that once the hammer has struck, the bell can sound fully. 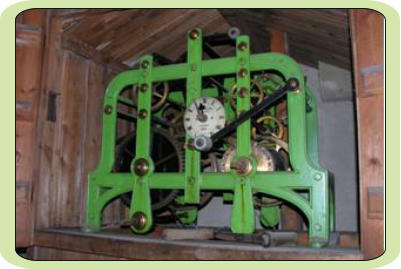 In 2007 the old clock mechanism moved to the Nave of St James and was replaced by a modern electric system made by Good Directions of Southampton (www.Good-Directions.co.uk) The CL200-230 is combined with a clock Resynchroniser that will restart the clock after either power failures or to adjust for changes in BST. The new mechanism was attached directly to the original Motion Works to drive the outside hands.